Volunteer to support parents through pregnancy, birth and the baby's first few months..
Parents 1st are currently in the process of recruiting and training volunteer parents and grandparents (and others with parenting experience) to offer parents-to-be and parents of a new baby in the Basildon area, friendly support and encouragement to keep healthy, have a positive birth and give their babies the best possible start in life. Please find attached an advert for a drop in session which is being held at Tilbury Children Centre on Wednesday 23rd May between 12.00 pm to 2.00 pm, this is an opportunity for those interested, to pop in and meet the friendly Parents 1st team and find out more about volunteering and the taster course that we are holding in the Thurrock area. 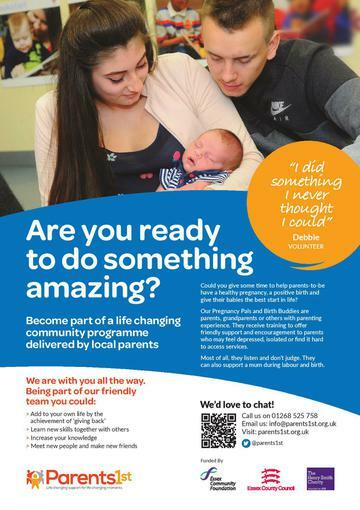 The 4 week taster course will be held every Monday morning (9.30 am to 12.30 pm) starting from Monday 11th June 2018 at Tilbury Children Centre.